I have been very excited to pick up and read Glimpse for Kendra Leighton for awhile. I don't know, I never really expected for ghost stories to be my thing but I've been reading several lately and they (and especially Glimpse!) have been really surprising and entertaining and just lots of fun to read. I am definitely looking forward to reading more ghost stories like this in the future and especially to read more with a British setting as well. That's always an added bonus for me. Glimpse is the story of teenage girl, Liz, who has not had an easy life so far. Seven years ago, at the edge of 10, she was involved in a car accident that claimed the life of her mother as well as all of the memories of her life. When she wakes up in the hospital, she has no recollection of who she is or who her father is. All she wants is a normal life with a full set of memories but instead, she wakes up with the ability of see 'glimpses' of bodies and people that nobody else can see. She also has terrible nightmares and she's bullied badly at school because of her odd behaviour and the strange way she's dressed. The bullying included in this story was quite to read about and it really made me sympathetic towards Liz right from the start. Then Liz and her father inherit The Highwayman Inn and they move back to the place Liz's mother was originally from in order to start over in this new place. Liz hopes for a new beginning and makes a 'Normalcy List' to help her in her goals. No more strange behaviour, no more nightmares, no more bullying. Fresh start, new life as new Liz. Despite her plans, Liz soon meets Zachary and everything that Liz has been running from comes at her from different directions and forces Liz to deal with them directly. I really loved reading Glimpse. I love how the story is based around the famous Alfred Noyes poem, 'The Highwayman' and how much that forms the narrative of this story. I had no experience with the poem before reading Glimpse, but the full poem is produced at the start of the story and then is referenced throughout. I really love when other stories or poems become the basis of something new in this way. I also enjoyed the fact that Liz and her new friend, Susie, begin researching The Highwayman Inn as part of their school project to learn more about ghosts and how haunted the building is which allowed them (and the reader) to learn more about the history of this time period. I thought there was plenty of suspense and tension in this book both from witnessing Liz's glimpses and her nightmares as well as from another angry ghostly presence for this book to be quite creepy and unsettling. Liz and Susie visit a medium in the area who has been in contact with some of the ghosts from The Highwayman, one of which in particular is hell bent on vengeance towards Liz which puts her in some mild peril. It was all very entertaining! 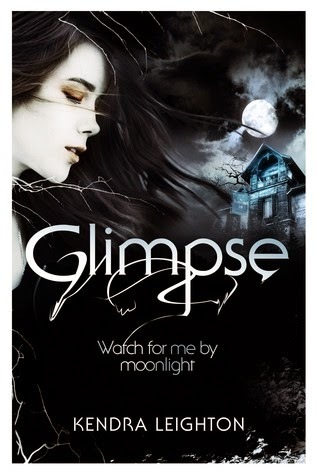 But Glimpse is also a love story and I really loved the combination of ghosts and romance in this book. There's lovely echoes of the love story between the highwayman and the innkeeper's daughter in all of the relationships within Glimpse and everything about this element of the story really made me happy. I really do recommend this book for anyone looking for a good ghost story! I have this on my shelf right now and you've just made me so so so excited to read this now! It seems to be the perfect blend of everything. :) Thanks for the awesome review.